Blogger Tip Tuesday is back and this week we’re breaking down SEO for bloggers. If your first thought is “what the heck is SEO?” then you are in the right place. SEO stands for Search Engine Optimization. What does mean for you? It means that SEO is essentially how people can find your blog in a search engine (i.e. google). It’s how you find different blog posts by searching things like “fried chicken recipe” “best bacon recipes ever” and “how to run faster.” (Oh, y’all don’t search for fried chicken, bacon and running? Weird.) How does this help you as a blogger? Well…if you want people to find your blog, then it needs to be searchable. That’s what SEO does. Okay, so now you understand (kinda) what SEO is. But how do you utilize it? This is where being self hosted comes in. Are you self-hosted? If not, stop reading and go read this and then this. Then come back and we’ll get to business! Okay, everybody self-hosted? Great. Here we go! The easiest possible way to integrate SEO into your blog is to use a trusty plugin! I use and recommend WordPress SEO by Yoast. It is so simple to use that you’ll wonder why you are just now starting. 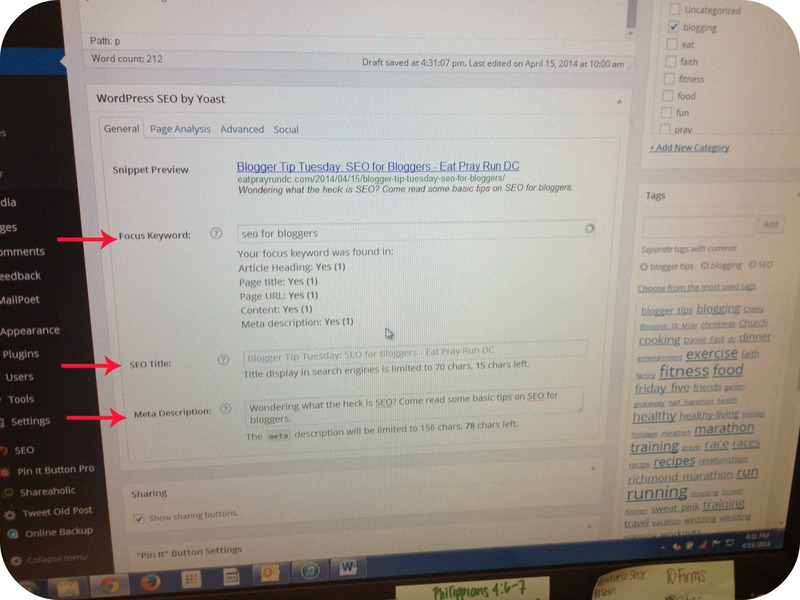 After you go ahead and install the plugin, start drafting your next blog post. Below the post, you’ll see a section titled “WordPress SEO by Yoast” – you’ll want to go through this section (under the general tab) and create your SEO step by step. See those 3 arrows? They each indicate things you need to attend to. First start off by choosing a focus keyword. 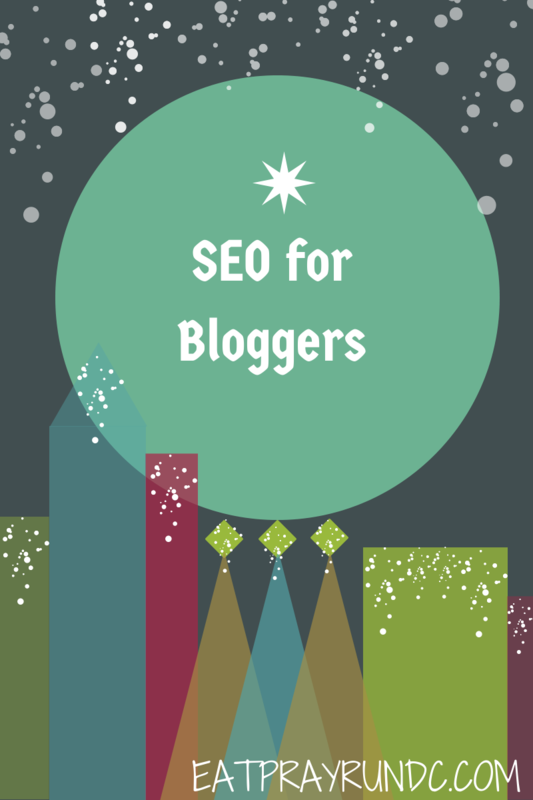 You can see that the focus keywords for this post are “seo for bloggers.” This means that when someone types seo for bloggers into a search engine, this post will pop up as a result. The stronger your SEO, the higher your post will be in search results. You’ll also notice that you are given some things to ensure — make sure your keyword is present in your URL, heading, title, content and meta description (more on that below). The second arrow is your title and this will populate automatically, although you can change it if you like. Finally, the last arrow is that meta description I mentioned above. The meta description is what the little preview of your post would look like on google. Meaning, it’s those few lines of text that pop up under google search results. You can see what this looks like by viewing the snippet preview, which is the very first thing on the general page. You with me? Wondering how you’ll know if you did all those things above correctly? Well, the plugin rates your SEO attempts with a little dot. 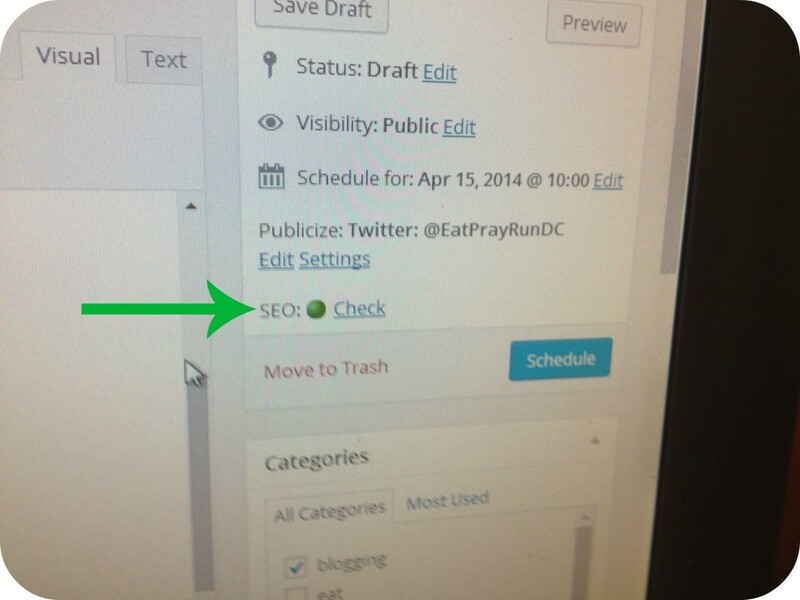 That dot will be red, yellow or green based on if you’ve done a good job with SEO. You want that green dot! You can find the dot under the Publish section on the right side of your screen. You’ll also see the dot after your post is published (then it’ll be on the top header). If your dot is red or yellow, change some things around. I don’t ever write with the sole purpose of getting that green dot but I will change language a bit, if it works for the post. I hope this makes sense! I’m certainly not an SEO expert and this post is really just scratching the surface but I hope it helps get you started in the SEO world. Do you pay attention to SEO when drafting blog posts? Great tip. I am adding this plugin sometime this week for sure. Oh good — I hope you find it’s helpful, Abby! I’ve found it really easy to use. Thank you for making this so simple! Thanks for the tip! I uploaded it and will definitely be using this! oh very helpful! I’m going to try to figure this out! Let me know if you have questions and I’ll try to help! There is so much I don’t know about blogging and I have been blogging for over a yea! I have heard of SEO but never really understood it until now. Do you know if you can use that plugin you mentioned if you are still using the free wordpress blog? Thanks Courtney an interesting read, I am on blogger as well as some of your other readers, do you or any of your readers have any seo tips for blogger? sorry gareth — i only work in wordpress, so i have no clue about anything blogger related 🙁 i’m sure SOMEONE out there does, though! Awesome tutorial! Thank you, and you’re the best!